Danny is a role-model for showing Chinese students how the fusion of Chinese and international education systems can prepare them for a place in one of the world’s top universities and for a subsequent successful career. After graduating from University of Cambridge with a master’s degree in land economy, Danny came back to China and began his career in international education. He now manages three international schools in China and UK, and founded AGS charity which aims to provide education in underprivileged areas in the world. With great passion and hands on experience in the field, Danny is currently leading business enterprise section, coordinating the various components and developing new business opportunities for Full Circle Education Group. Laurence Gribble graduated from Trinity College, Cambridge, where he read Chinese Studies. Laurence is fluent in four languages, has travelled to 40 countries, and in 2014 cycled from London to Hong Kong, raising more than £20,000 for charity. Laurence and Danny Wang (Managing Director of Full Circle) founded both Adventurous Education and AGS charity. An alumnus of St Bees School, Laurence currently is the deputy director of Full Circle Education, striving to design an offering that incorporates both academic and parallel curriculum excellence for every pupil. Sarah graduated from Manchester University with a Master Degree in Education. A qualified member of CIM (Charter Institute of Marketing) and CMI (Charter Management Institute). Sarah had been the International Manager of English UK, the national trade association of English language training in the UK, since 2005. She has proven experience in sourcing and delivering multi-million dollar multi-track projects and campaigns in many countries with a consistent proven track record of high standard and satisfaction from stakeholders. As one of the UK official education and training sector representatives, Sarah has participated in the market scoping visits to over 20 countries including Czech Republic, Hungary, Japan, Vietnam, Cambodia, India, UAE, Syria, Lebanon, Jordan, Costa Rica, Brazil, Argentina, Chile and Angola. Created English UK from two predecessor organisations; set up company and charity, established brand. Michael has 20 years of branding, marketing, advertising and senior management experience in both client and agency settings. Michael began his career as a brand management at Procter & Gamble USA. Shortly thereafter he returned to his native Hong Kong to do Asia/Pacific brand marketing and has spent the last 20 years in Mainland China. Michael holds an MBA degree from Baruch College, New York and a Bachelor of Business Administration from University of Windsor, Canada. 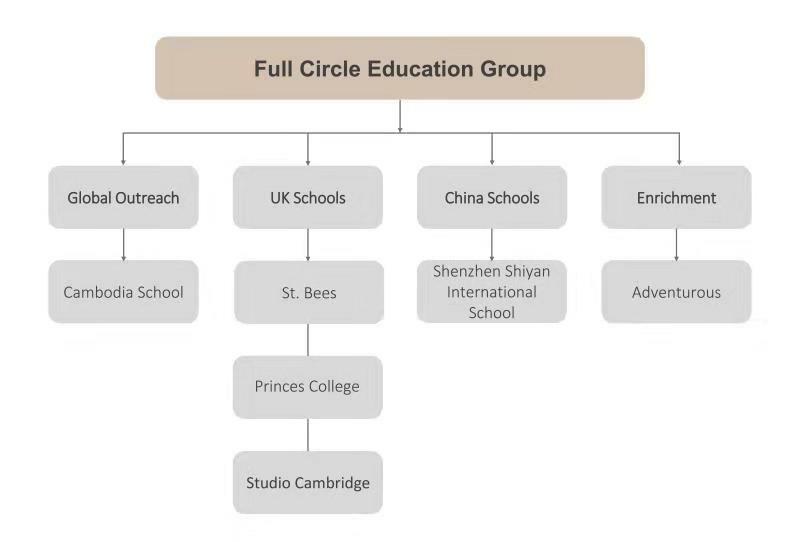 Currently Michael is responsible for Full Circle Education’s project development and implementation in China. Vivian is the Marketing and Admission Manager of Full Circle Education, a role held since 2018. Prior to this, she was a UK Education Consultant and Personal Assistant to Director at Britannia StudyLink, a leading education consultancy firm in Hong Kong. Vivian obtained a Bachelor of Social Science in Psychology from The Chinese University of Hong Kong. She started her studies at St Bees School at the age of thirteen. She believes that the UK is one of the best countries for providing high-quality education. With her academic and professional background, she is fully committed to helping students to make the most of their time at St Bees School and reach their full potential. As a B.A. graduate majored in English education, Maya started her career as a senior high school English teacher in China. Following 6 years of working at business department as deputy director in shipbuilding offshore engineering industry, Maya became the China Uk business operations coordinator, enhancing successful cross culture collaborations. Maya is a firm advocate for improving education offerings in China, as a cross culture learner herself, she understands that China’s rapid development and growth as a global powerhouse brings with it the need for deep understandings of how to interact inter-culturally in an international world. Maya has joined Full Circle as project manager and PA to Director of Education, her personal mission is to help innovate and implement the Fusion Education Approach to full circle school all over the world, ultimately to achieve the high educational standard to which we all aspire. Graduated from Trinity Univeristy in the United States, Rella is now P.A. to Full Circle Education’s managing director Danny Wang. She is involved in the group’s coordination and support of human resources, finance, business development, as well as marketing. Rella began studying abroad at the age of 14 in Bangkok International School, one of Thailand’s most prestigious schools. After graduation from university, she returned to China and began her career in international education field. Out of her passion and beliefs, Rella is contributing to the development of Full Circle with her own background and experience in international education. Christine has more than ten years of financial related work experience and CPA license. She has worked as finance manager in international schools and participated in the CIS certification program as the school’s committee member. Currently Christine is responsible for Full Circle Education’s financial management of different projects both in China and abroad, including the establishment and execution of Financial SOP, data analysis, cash flow control, etc. Under the influence of the international education concept, Christine is committed to becoming a lifelong learner with an international vision and contributing to the development of China’s international education. Jack graduated from Guangdong Ocean University and worked in the landscape design institute of Country Garden Real Estate Group and Adventurous Education. Currently, he is the visual identity designer of Full Circle Education, providing brand design and strategy communication online and offline services for the education group. Jack believes that design creates visual assets and precipitates important brand value. Kenrick Wong graduated from the University of Hong Kong with a Bachelor and Master of Architecture and was an exchange student in Paris. He worked in Rocco Design Architects and several architectural firms with different scales. He believes that architecture is a powerful tool for volunteer, cultural and education projects. With seven years of volunteer + design experiences, Kenrick currently co-founds Orient Occident Atelier (OOA) and Adventurous Global Schools (AGS) charity to explore the modern interpretation of Eastern and Western aesthetics, while focusing on the integration of nature, function and the community. He directs the design, construction and management of the prototype school, educational tours, and integrates village development with researches on local construction and material. The first self-initiated village school is completed in Cambodia in 2017 July. Currently Kenrick works as the architect for Full Circle Education Group. Richard is a graduate of Manchester University, where he studied Economics and Politics. After graduating, he taught English in Taiwan, Portugal and in the UK, before joining Studio in 1995, firstly as Course Director of a Summer Camp and then as Head of Young Learners. He went on to build the portfolio of summer camps at Studio Cambridge, and as Operations Director since 2003 he has been responsible for the smooth running of the school and its campuses. He also travels internationally on behalf of the school, meeting partner agents, schools and students. Nicole has an MA and an MPhil in French and Linguistics from the University of Cambridge (Emmanuel). Her passion for international education came from an early age, after spells of schooling overseas in Canada and the US, and a year teaching English in France. She joined Studio Cambridge in 1998 initially in a temporary role, and enjoyed her experiences so much that she stayed, eventually becoming Sales Director in 2003. She has been responsible for developing a network of loyal partner agents and schools around the world over the last 15 years. Richard graduated in Chemistry from Queen Mary College, London. He taught in Chile and Spain, as well as several Studio summer camps before permanently joining the Studio teaching team in 2000. He is Trinity Dip TESOL qualified and is a CELTA trainer. He has come through the Studio ranks from teacher to Director of Studies, before taking on his current role of Academic Manager in 2008. Richard is responsible for all aspects of Studio’s academic programmes. Tim graduated from de Montfort University in Combined Arts. He taught in Malta and Portugal, as well as several Studio summer camps before permanently joining the Studio teaching team in 2008. He has since become an experienced summer Course Director for both Young Learners and Adults and is our main Director of Studies year-round. In this role he gives advice and information to students on their language studies. He assesses students’ initial levels of English, gives advice on the most appropriate courses for each individual and prepares progress reports for sponsors, parents and universities. Layla graduated from Anglia Ruskin University in Politics and Women’s Studies. She has been at Studio since 2002, starting as a summer camp Course Director, before becoming Head of Young Learners. She took on her current role as Operations Manager in 2008, and she is responsible for the day-to-day running of the school outside of the classroom. She oversees, HR, Safeguarding, Welfare, Student Services and Accommodation and is a key member of the summer camp planning team.